The palms of our hands contain a concentrated network of small arteries and veins which work like radiators or heat exchangers. These structures are called arteriovenous anastomoses (AVA), and are the reason such a small area can potentially exchange larger amounts of heat or cold than their surface area alone would indictate. Providing cooling to hands can be effective in improving comfort and helping reduce the sweating response. For this reason, Coolture developed a unique "fingerless glove" -- a gauntlet constructed from performance spandex, resulting in a snug but comfortable fit. One CoolPak slips into the concealed pocket of each fingerless glove, with a thumbhole that positions the hidden CoolPak directly onto your palms. 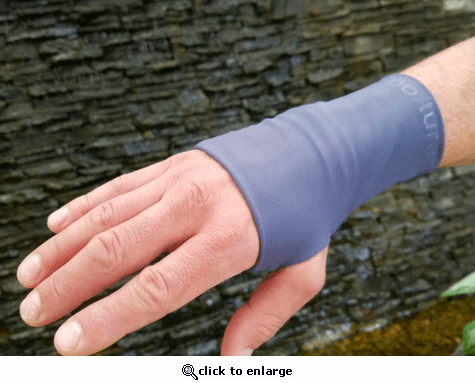 For those times you need more mobility from your hands, simply slide the gauntlet to your wrists, which frees your hands for gripping, while still providing cooling power to your wrists! Third Party Scientific Testing determined that Coolture CoolPaks provide a longer-lasting release of cooling than competitor brands -- and even longer when used within the Coolture Cooling Vest. Colder and lighter than ice or gel, the performance of the Coolture CoolPaks is further enhanced by the Outlast\xAC technology that comprises the garment's lining. This "space age" technology was developed for NASA for its ability to absorb and store body heat. For Coolture, this technology also prevents the shock of cold associated with other cooling vests. Adaptation: Much like jumping into a cold swimming pool, eventually you will "adapt" to the cooler temperature, causing you to believe that the "cold" has ceased. As we all know (thanks to cold swimming pools and lakes), the cold hasn't stopped being cold -- but rather we have adapted to the cooler temperature! You can test the Coolture cooling power by simply slipping your hand beneath your cooling vest. Even hours later, you will experience the cool of your skin. Similar to dry ice, Coolture CoolPaks freeze colder than ice or gel, and remain colder than ice or gel. Food safe, non-toxic, and non-staining. Once activated, you will notice a "slippery" quality to the exterior of the CoolPaks -- this is completely harmless and disappears after three or four freezings. Depending on how often you use your cooling vest, your CoolPaks may lose density. When immersed into warm water for 15 to 20 minutes, your Coolpaks will return to their fullest density! No Effort Method: Toss flat CookPak sheets in with a load of laundry. Remove, wipe dry, and freeze! This method plumps the individual cells to their maximum thickness for maximum cooling. Hand-Scrunch Method: Immerse flat CoolPak sheets into a sinkful of very warm water. Let them soak for 20 to 30 minutes. If all cells are not completely activated, scrunch the "stubborn" cells until they are plump (the plumper the cells, the longer the cooling). Remove, wipe dry, and freeze. Plastic Sleeves: There is a "slick" quality to the CoolPaks until they have been used 3 or 4 times. After several uses, the slippery quality dissipates. We provide fitted plastic sleeves in the event you prefer to keep your CoolPaks covered. When kept in the sleeves, however, the slippery quality never dissipates. NOTE: When inserting frozen CoolPaks into your cooling vest, it helps to slightly "fold" each pack while guiding them into the snug interior pockets. Colder and lighter than ice or gel, the performance of the Coolture CoolPaks is further enhanced by the Outlast® technology that comprises the garment's lining. This "space age" technology was developed for NASA for its ability to absorb and store body heat. For Coolture, this technology also prevents the shock of cold associated with other cooling vests.